A playful illustration incorporates the passions or pastimes that make them two-of-a-kind. Full of personality, this charming blanket lets love birds know they're truly two-of-a-kind, with a playful illustration featuring the passions or pastimes that make them, well, them. 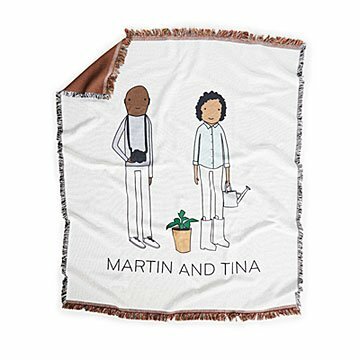 Create your "characters" by choosing their hobbies, skin tones, hair color, and clothing, then give the charming keepsake to the couple that makes the the world a more interesting place. Illustrated by Shelly Klein in Michigan. Woven in North Carolina. Printed in Alpharetta, Georgia. At this price point, it was disappointing that the blanket quality wasn't better. I was expecting a thicker, warmer blanket. This feel thin and very stiff. Hopefully it softens up after a good wash - was just expecting something more!